The hill Bradlo erects above the town of Brezová pod Bradlom in western Slovakia with the Barrow of Milan Rastislav Štefánik on its top. The remains of M.R. Štefánik (1880-1919) were placed there on 11th May 1919. 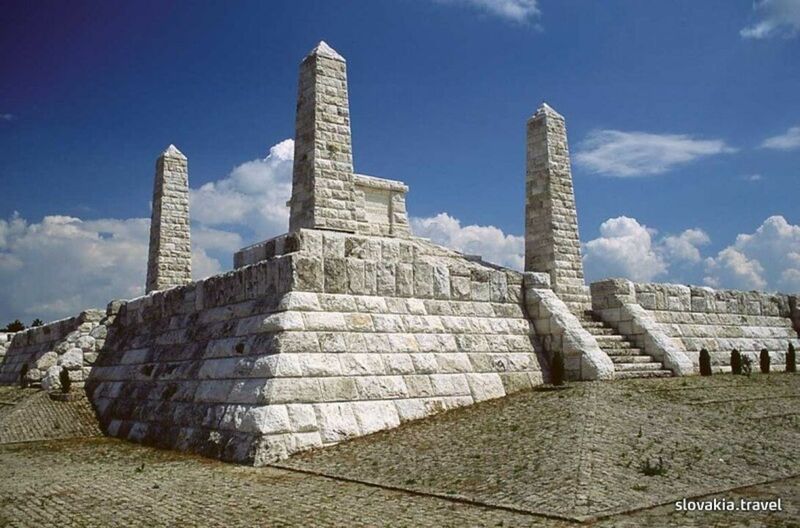 The magnificent Barrow made of white travertine from Spiš was built in 1928. It was designed by Dušan Jurkovič and it was solemnly dedicated on 23rd September. Every year in May mass all-nation meetings celebrating life and work of Štefánik are held at the Barrow. The Barrow on the Bradlo is composed of two terraces with the tomb construction itself standing above it. Both terraces have sloping sides built from thick rectangular bricks. From the second terrace the stone Barrow itself stretches up from the hill. From each corner of the barrow two stone obelisks grow into the height of 12 m.